Air New Zealand has released a new commercial, inviting you to book an Economy class fare for 2 or more people and save 50% on an Economy Skycouch upgrade until January 30. 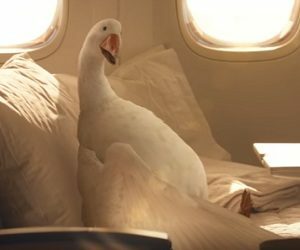 The 15-second spot features a goose in a plane, saying: “If you’ve got a strong nesting instinct, like me, you’ll love the New Zealand’s Economy Skycouch upgrade”, and then asking for someone to turn the lights on. The ad ends with the onscreen line “50% off Economy Skycouch when you book for two or more people”. Viewers are also informed that Honolulu is excluded and are advised to visit the airline’s website to check the applying travel periods and conditions. Not to be ignored: Percentage based card payment fee applies to credit and debit cards.